Evelyn Smith joined the Cooperative Commonwealth Federation in 1933 but later disagreed with the movement for what she believed were its departures from the principles of the Regina Manifesto. In recent years, she has become a strong environmental activist. 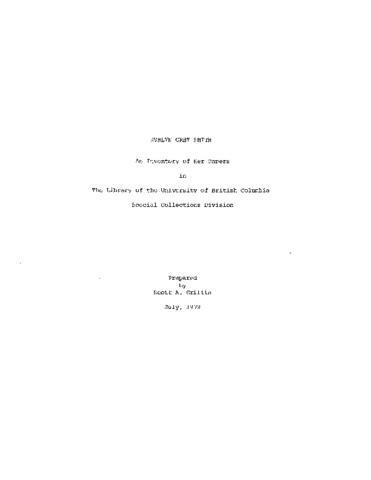 The fonds consists of correspondence and clippings pertaining to the CCF political movement and Smith's newsletters, newspaper columns and submissions to various commissions. Fonds also includes a transcript of an interview with Evelyn Smith conducted by Rachel Epstein.